Doris has already appeared in the other stories, but she's always intrigued me the most of the three. She's the most cerebral, so a lot of the story's "action" goes on in her head. SOBRIETY TEST was the hardest to write for that reason - from start to finish, about seven minutes elapse in the setting. Served is the second of a set of three short stories based on my novel in progress. Gina is the youngest, most impulsive of the sisters, and a rash decision made at the age of 19 has serious repercussions that she takes steps to resolve five years, one child and a black eye later. Short Story "A Perfect Storm"
Finally got a short story written - it's one of three I've been working on during the past few months. "A Perfect Storm" is a character sketch of Lily, the middle sister in my book-in-progress. Lily is a painter with marital problems - mainly, her husband's ego. She deals with it through her art, but it's not likely to be a long-term solution. Please read the story - I hope you enjoy it, and I would really appreciate feedback. Many weeks of physical therapy later, my elbow is about as good as it's going to get - which is about 92%, plus or minus a percent or two. I hope it doesn't become one of those pressure-sensitive joints that can predict weather changes better than the meteorologists ("But we have all these microclimates to consider..."). So, the real question becomes, when to start writing again? I have my three main characters for my next novel clomping around in the attic of my brain and wanting to have their say. School has finally started for the kids, so my days are my own again. But it's been very hard getting back on track. Am hoping this very short blog will get my brain going again. There could be a lot more blogging in the near future. My grand plans to work on the three character sketches took a back seat when I woke up one morning with shooting pains down my right forearm. Could barely pull my shirt over my head, found it painful to brush my teeth, and forget picking up my morning mug of tea. Putting the car into reverse was excruciating - I thought about driving to the hospital backwards. Doctor told me it was tennis elbow - why is a pretty common ailment named after a sport that only a small percentage of the population plays? In my case, I got it from pulling weeds - much less country club in origin than its popular name. I bought myself the elbow strap, started applying ice and ate ibuprofen with the same zeal that I attack a bag of M&Ms. The pain has diminished, but it's still there. This development has put a crimp in my writing schedule, as the cooking/cleaning/chauffeuring (ouch...) still had to be done but much more slowly. Will slowly get back to the writing. I'm working on my second book now - there are three sisters whose half-sister accidentally kills her husband with a glancing blow to the head of her frying pan. Doris, Lily and Gina are definitely living in my head, and I have to get them down on paper. Their half-sister, Betty, is also banging around up there (with her frying pan), but the sisters are the women who have to come out first. Writing short stories is an art form that still eludes me. Years ago, I called myself a novelist because I could not write a story shorter than 8,800 words. it was impossible for me to do. Then I joined a writing group with two poets, and I discovered the power of brevity. With poets, every word counts. No long descriptions, no unnecessary flowery phrases - an entire piece consisting of as little as 27 words. It's been eye-opening. TIME WILL REVEAL is the first short story I've written that is less than 5,000 words. I've started writing about Gina, who swings a tennis racket rather than a frying pan, and I'm hoping I'll have something to post in a few weeks. Wish me few words. I have my husband, Benoit, to thank for the story finally making an appearance. He's a software engineer and loves technology - time at Facebook and Yahoo has convinced him that social media and the Internet are the best modes of advertisement and marketing for new authors. He'd been encouraging me to write a short story and post it for free, just to get my writing out there. "Yeah, right," I said, while scheduling the next month's bill cycle and coordinating music/sports/language classes for the girls. "Just as soon as I have time." So, bless his heart, Benoit put me up in a local motel for a weekend and said, "Write well." He's definitely nominatable (word?) for "Best Supportive Husband." I put that time to good use: one night of mah jong with pals, and the next day was devoted to writing "Time Will Reveal." The first draft was done before checkout the next day. Got it finished a few weeks later. The best gift a writer can receive is a quiet place and time to write. Thanks to everyone who has made that possible for me. I have been the lucky recipient of many acts of kindness, and this last act was also a lot of fun. Three glasses of wine before the reading ensured it went pretty smoothly - I was mellow enough not to be nervous yet still read without too many tongue trips. I also got some good suggestions on how to fix the story (editing, to me, is sometimes like cutting off fingers and toes, even though the extra digits really have to go). But better than the book sales and warm reception to the story was the outpouring of goodwill and humor from the people who attended: neighbors, family and friends who came to drink and laugh and show their support. The evening ended on a goofy note. As Val and her husband Lars are neighbors, my husband heard the party goers leaving their house. Our neighborhood is pretty rural, and Benoit thought it would be hilarious to howl like a coyote. He managed to freak out at least two friends - great way to help book sales, Sweetie. On November 3, I was one of three featured authors invited to give a reading! It was a really eclectic mix of authors: me (the only fiction writer), a professor of Jewish Studies who'd written a book about the Judaic traditions surrounding women's menstrual cycles (really), and a professor of Asian American Studies who'd written a book about AsAm artists. I wondered how it would go over; surprisingly, it was a very interesting talk. My Jewish printmaker friend Eva adored it. It was well attended - mostly because I'd sent out a shotgun blast of email telling my friends and family about it. And a lot of them came and were very supportive. Really, it was a real gift to see all those friendly faces in the audience - thanks to everyone who attended (and really special thanks to everyone who attended and bought a copy of CHOPSTYX). 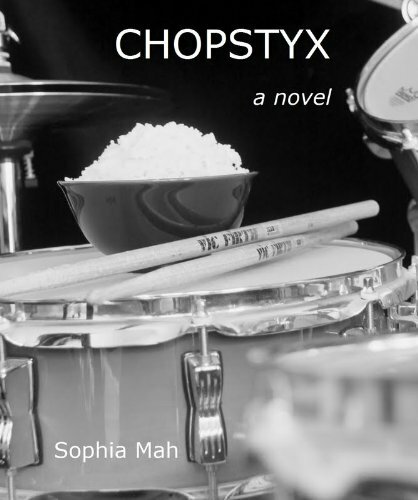 Nine years ago I started writing the first draft for CHOPSTYX. At that time all I had was the idea that I wanted to write a "thank you" book to my family and friends who had seen me through a very rough patch, both emotionally and financially, after my divorce from my first husband. In January 2003, I was feeling very grateful for the way my life had turned out (happy second marriage and second child on the way). I didn't want to write an autobiography of those two years living alone - with almost half of all marriages in CA ending in divorce, it wasn't new ground. I think I was watching a lot of music videos about this time - I was pregnant with my second child and suffering from sciatica. The best relief was sitting on the couch with my feet up and checking out the latest MTV offerings. Watching all those leather-clad, bare-chested guitarists ripping out solos and singers belting out tunes in front of thousands of shrieking fans made me think, "Well, that's something I can't say I've ever done." I chalked it up in my "Not Going to Do that in this Lifetime" column, next to being a Bond Woman. But the writer, buried under baby weight and boredom, said, "Why not be a rock and roll star, at least on paper?" Hence, CHOPSTYX was born. I finished the first draft in December 2003, and my daughter Natalie was born two weeks later. Then came the mind-numbing years of diapers/breastfeeding/coping with a jealous toddler, and I didn't get back to the book until about 2006. Cleaned up the first draft, cleaned it up again, and kept polishing while I looked for an agent. Was invited to Squaw Valley, where my group gave me great feedback and encouragement. Kept looking for an agent. The publishing world was turned on its head by the introduction of ebooks, and then I started getting a tad frustrated. Took a yearlong break from the search as I was becoming a tad demented with frustration. Finally, my brilliant computer guy husband suggested I go the self-publish route. Saw a psychic who said the same thing (long story), so here it is - CHOPSTYX. Nine long years in the making.